Shopee Malaysia has created a weekly video series named #ShopeeAdvice to promote the products on its website. The new series currently has two videos, with the first featuring an inconsiderate colleague who is prone to talking and slurping his food loudly. The next video features a cockroach named Jimmy scurrying across office desks, deftly dodging the various attacks of humans. The video ends by featuring the products used in the video. In a statement to A+M, Shopee’s spokesperson said #ShopeeAdvice was created with the aim of showing consumers lighthearted and easy to consume content that ties back to the variety of categories that Shopee has. “It is a form of advertisement, one that isn’t in your face and hard selling. But done rather subtly. That way, the videos will also serve as content worth watching. We believe engagement would be a lot better that way,” the spokesperson said. The spokesperson added that Jimmy the cockroach is one of the many personas under the #ShopeeAdvice video series, and Shopee will feature certain personas more frequently depending on consumers’ preferences. “We have always communicated our fun DNA through various of our marketing initiatives across the board. We hope that the #ShopeeAdvice series will amplify our brand identity,” the spokesperson said. Shopee’s attempts at being cheeky this year have been a hit-or-miss. 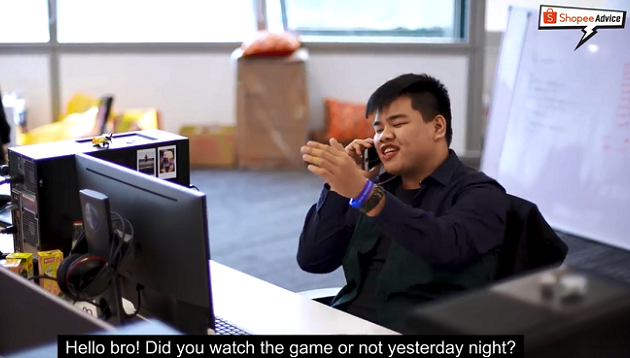 In February, it’s Valentine’s Day video poked fun at Lazada Malaysia’s “Slash” the Leng Chai Lunar New Year video, featuring a similar concept and close up shots. However, its recent attempt at taking a cheeky swipe at Lazada’s birthday bash fell flat on consumers, garnering the criticism of netizens who deemed the move as not “professional” and not the “right way to do marketing”. Shopee has since removed the post. Netflix has hired Belle Baldoza as its new consumer PR Manager for APAC. ..
Avinash Himatsinghani, senior vice president and general manager, Southeast Asia of Fox International Channels Asia will be leavin.. The PR agency brain drain to the client side continues, and recruitment remains a challenge, particularly as agency services diver..